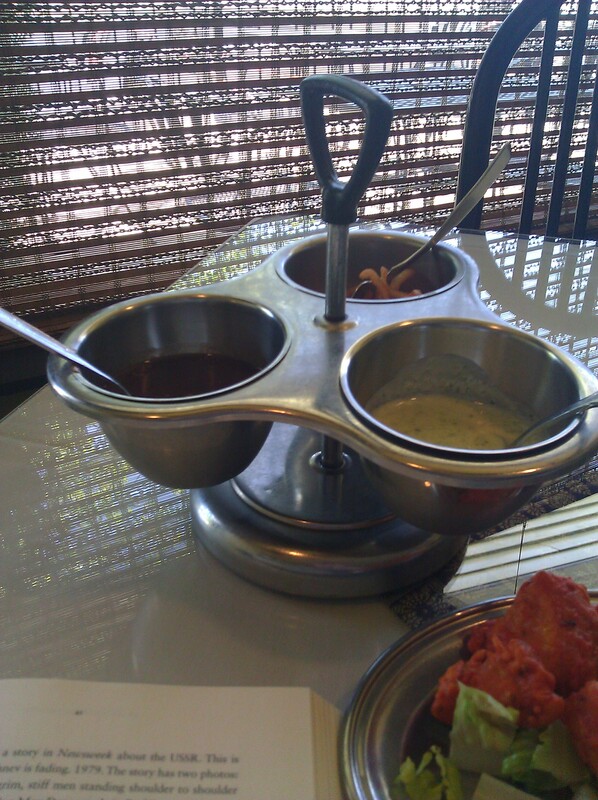 I love Indian food. I know exactly when my love affair with Indian food started. I was in grad school in 1993, and my German ex-boyfriend visited my family and me for Christmas. He had a craving for Indian. I looked up Indian restaurants in the phone book, and we headed off to what I am fairly certain was Cafe Tandoor on Cedar Road in Cleveland Heights. The Saag Gosht (lamb with a seasoned spinach sauce) sounded good to me, and I’ve been a fan ever since. It may not look pretty, but it is delicious. 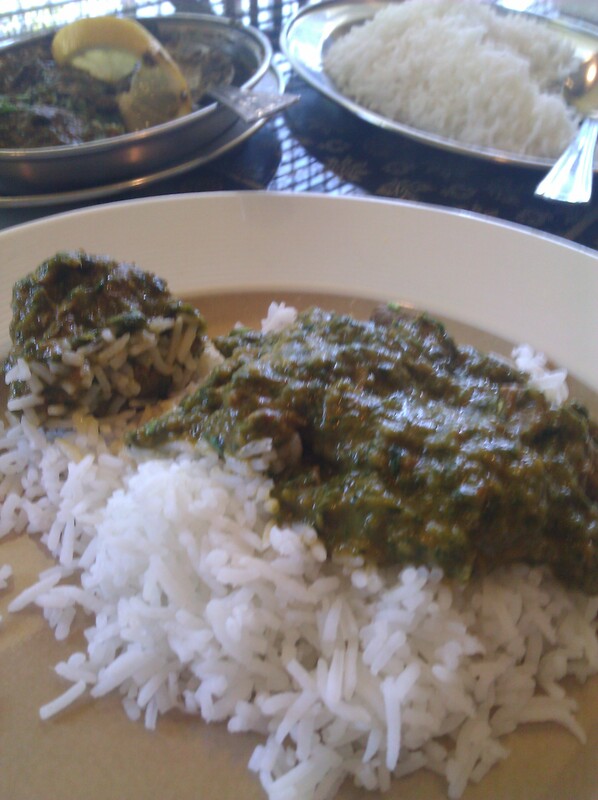 Since then I have tried many Indian dishes with varying enthusiasm, but I always come back to my Saag Gosht. Sometimes I go crazy and order Chicken Saag, but most restaurants don’t have it on their menu. The fact that I met the owner of the restaurant last summer during an NEO Food Tour and she was absolutely lovely helps me want to support the locally owned independent restaurant even more (she and her husband also own the Atma Center and Taste). I was craving Indian the other day and decided to visit the very same Cafe Tandoor that started it all for a late lunch. They also have a location in Aurora that I visited numerous times when I lived with my parents for brief spell in 2001 as well as one in Westlake for you West Siders. I love their garlic naan, which is topped with garlic and butter, but I didn’t order it this time around. It is best shared with others . I started my meal by ordering the chicken pakora and vegetable samosas. I ate half of each and took the other half home. They were accompanied by a nice variety of yogurts and chutneys. 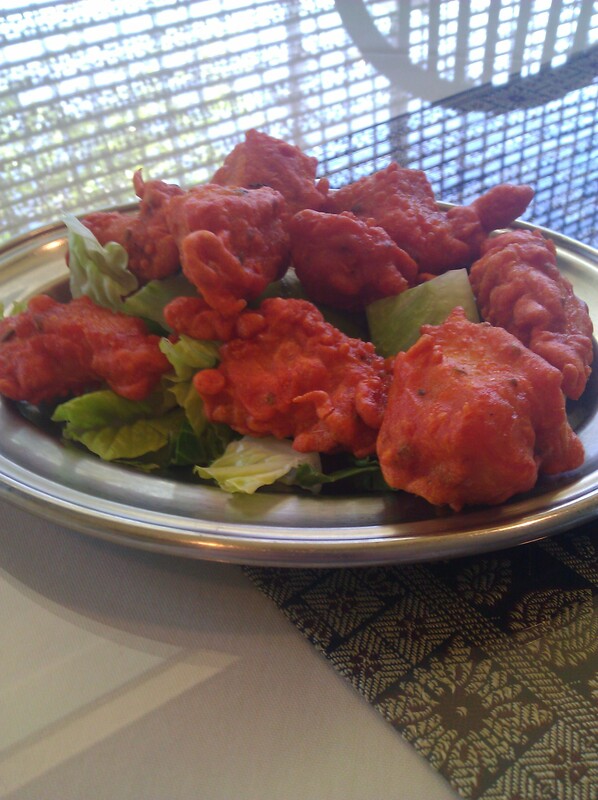 Chicken pakora are boneless pieces of chicken mixed with spices and chick pea flour and deep fried. Th e breading was so light I didn’t notice it at all. The chicken pakoras were not too spicy and just a wee bit dry, but the chutney moistened them up sufficiently. 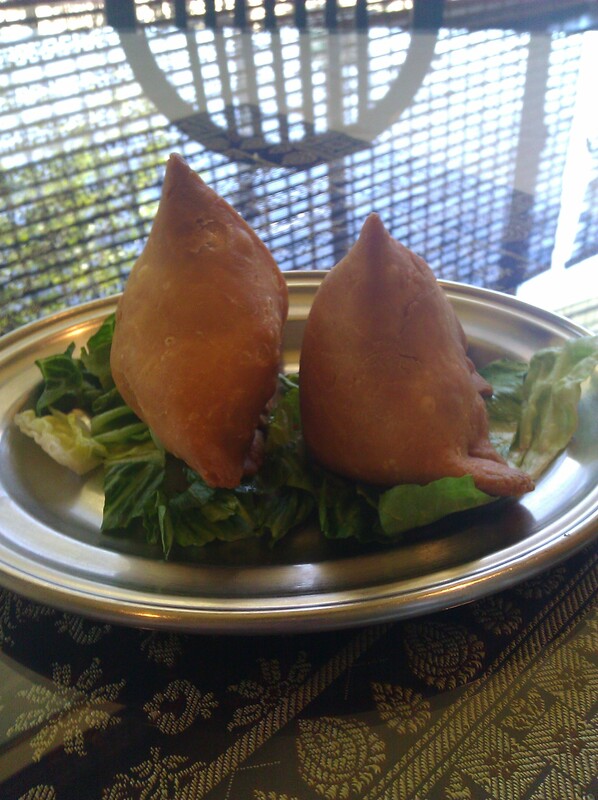 Samosa are triangular pastries filled with potatoes, peas, cashews, raisins and spices. The samosa was as delicious as ever. They have to be my favorite Indian appetizer. As I stated before, I ordered the Saag Gosht. I ordered it mild, because I am a big baby when it comes to spicy food. It was not overly spicy and perfectly seasoned. The lamb was not to fatty or too dry. It was succulent and paired well with the spinach. 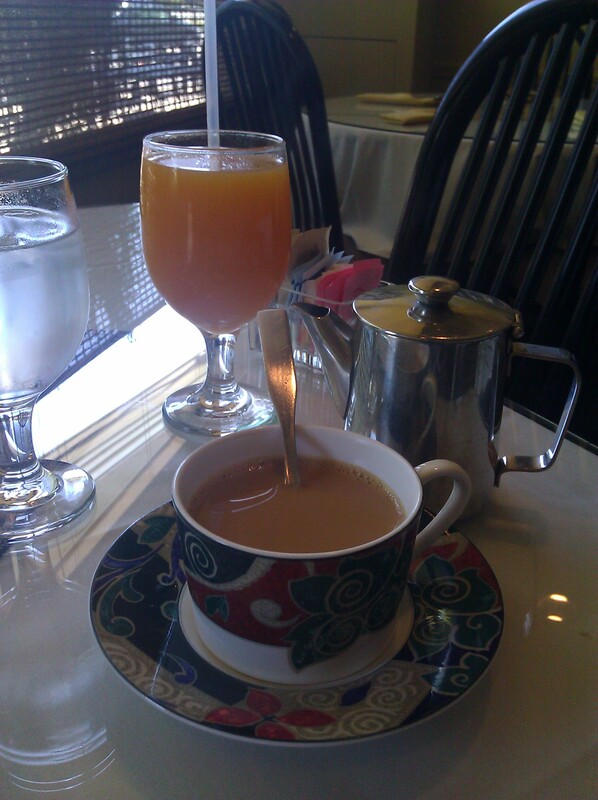 I ordered a mango juice and a chai (Masala tea). The mango juice was refreshing and was a nice palate cleanser. I was less enthused about the chai. My best friend’s mother makes a delicious, well-seasoned chai with black tea and Indian spices such as cardamon. This one was sadly lacking in any kind of flavor, and the addition of sugar did not help it much. If you like fish I highly recommend ordering the Bombay Fish Curry, which features catfish simmered in garlic, ginger, lemon and spices in a tomato-based sauce. I ordered it through Deliver Me Food and loved it. Cafe Tandoor was voted Cleveland’s Best Indian Restaurant in the Cleveland area Hot List, so if you haven’t tried it I suggest you do.